Hilde Kate Lysiak got a tip Saturday afternoon about something untoward happening on 9th street in Selinsgrove, about 150 miles northwest of Philadelphia. She went to the scene to get the details and posted a story and video clip on her website the "Orange Street News" later that day. Soon after, her Facebook page and YouTube channel were clogged with negative comments urging her to "play with dolls" and have a tea party, and questioning her parents' judgment in letting her do such work. "It kind of gets me angry because, just because I'm 9 doesn't mean I can't do a great story," she said Tuesday. "It doesn't mean I can't be a reporter." 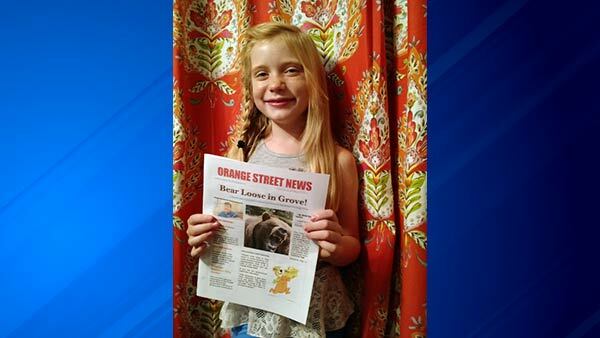 Hilde has run the "Orange Street News" since 2014. She gets some help from her father Matthew Lysiak, a former reporter for the New York Daily News, and her 12-year-old sister, Isabel Rose, who handles videos and photos. Matthew Lysiak said Tuesday the comments on his daughter's stories are usually positive. "She was embraced when she was doing cuter stories, but about six months into writing the paper, she got more confident and started stepping outside the box," Lysiak said. The debate is all about whether it's appropriate for a girl her age to be covering such news. "She found journalism really interesting, and my older daughter, too. They would ask lots of questions," Lysiak said. She's normally unfazed by comments and normally doesn't even read them, he said. "The tea party comment really lit a fuse under her," her father said. "She was pretty annoyed by it all." Hilde hit back with a video on her news site, posted Sunday, first reading some of the comments aloud, including "I am disgusted that this cute little girl thinks she is a real journalist. What happened to tea parties?" and "Nine-year-old girls should be playing with dolls, not trying to be reporters." "I know this makes some of you uncomfortable, and I know some of you just want me to sit down and be quiet because I'm 9. But if you want me to stop covering news, then you get off your computer and do something about the news. There, is that cute enough for you?" Anne Carter, a licensed practical nurse in Selisgrove, was among those who commented disapprovingly on Facebook of Hilde's involvement in the story. "I think she's very talented and her aspirations are great, but it's probably a bigger case than a 9-year-old should handle," Carter said. "Adults in the community are having trouble wrapping their heads around what happened. I can't imagine how a 9-year-old can cover a story like that." Hilde is undeterred. When asked if she has a follow-up story in the works on the suspected homicide Hilde replied: "You'll have to find out what happens in the next issue of the Orange Street News."